TJP Publisher and Editor Sharon Wisch-Ray served as the moderator for the interview of Match Group North America CEO Mandy Ginsberg. (From left) Sharon Wisch-Ray, Linda Glauben, Carol Kreditor, Mandy Ginsberg, Pam Fine, and Laurie Betesh, incredible representatives of Dallas’ successful women in the work force, are committee leaders and speakers at the debut of the return of the Jewish Women’s Philanthropy Center’s Career & Professional Affinity of the Jewish Federation of Greater Dallas. If you were in the audience of the Jewish Women’s Philanthropy Center’s Career & Professional Affinity program Monday night, it was apparent that the Dallas Jewish community is filled with such leaders, as well as those of this generation, like guest speaker Mandy Ginsberg, CEO of Match Group North America, and the many who came together to share the power, joy, and respect of this community’s professional women. Monday evening’s program was attended by close to 70 people and moderated by TJP Publisher and Editor Sharon Wisch-Ray. The event was the debut of the return of the Career & Professional Affinity, which is co-chaired by Laurie Betesh and Linda Glauben leading a committee of Jill Bach, Judy Barton, Megan Hyman, Jolene Risch, Amy Schachter, Deb Williams and Susan Wisch. 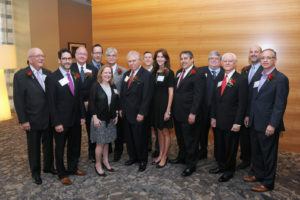 The group, which has been renewed under the Community Outreach and Engagement division, is co-chaired by Cathy Brook and Pam Fine, and is a part of the Jewish Women’s Philanthropy Center, an umbrella that covers the Education Committee, the Women’s Campaign, the Leadership and Younger Set divisions of the Jewish Federation of Greater Dallas. Kreditor introduced the Federation’s upcoming marketing moniker of #FedProud, inviting all to become more involved, engaged and educated as to where the almost $10 million raised in the 2015 Campaign was shared, and voicing the hope that the more people know, the more they will want to give, and give proudly. Monday’s evening was filled with women from across the generational “un”divide, professional lines; corporate financial wizards and legal minds who office in tall buildings, women who run offices from home, sole proprietors and corporate leaders, and others who are the CEOs of their family. The group’s next meeting is March 14, again with a focus on bringing together like-minded Jewish women, who span a variety of industries and experience levels together to connect their professional lives with their philanthropic values. 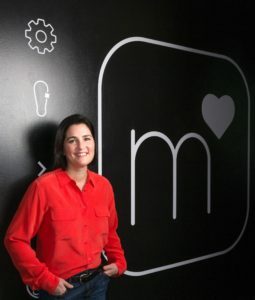 Mandy Ginsberg, the CEO of Match Group North America, where she is responsible for Match U.S., Match Affinity Brands, OkCupid, PlentyOfFish, and the company’s overall North American expansion, is a Dallas native who went to The Lamplighter School and The Hockaday School. She grew up, the daughter of Buman and the late Joy, on Northaven, just down the street from the very Jewish Community Center building where she now returned to speak about the strength and respect of working women. “The world is changing and there are so many women in the career-place trying to juggle it all. 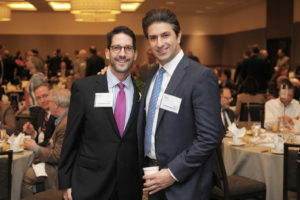 It’s hard to stop and connect; lunches, meetings, deadlines — it’s tough to get together but this kind of career-minded group, from within our community, definitely clicks with me,” said Ginsberg. She was a 2012 honoree by JWI — Jewish Women International — as a “Woman to Watch,” who was named and celebrated her bat mitzvah and first wedding at Temple Emanu-El and was a member of BBYO’s Fannie Sablosky chapter who summered at Camp Sabra. Wisch-Ray, who called the evening her own “Oprah moment to take off my bucket list,” spoke also to the fervor she has as a businesswoman in a very male-laden industry. Ginsberg, who attended the Federation’s Teen Tour to Israel program, returned later — when her first job out of college was as a tour guide for the program, ultimately making Israel her home for three years. She received her undergraduate degree from the University of California at Berkeley and an MBA from The Wharton School of the University of Pennsylvania. Ginsberg then returned to Dallas, a single mom whose own mother was fighting a battle against ovarian cancer — one that Ginsberg wouldn’t let her fight alone. “I’m not sure I ever pictured coming back to Dallas but when my mom got sick there was no question and it turns out that in every way it was the best decision,” said Ginsberg, the mother of Maya and Talia, and wife of Madhu Rajendran. Ginsberg also served as the CEO of The Princeton Review, where she expanded its services to include online services, including tutoring and college counseling for a new generation of students. Ginsberg’s customer experience acumen developed during her tenure as vice president of consumer technology for Edelman Public Relations Worldwide, then subsequently in her role as vice president of worldwide marketing at i2 Technologies. 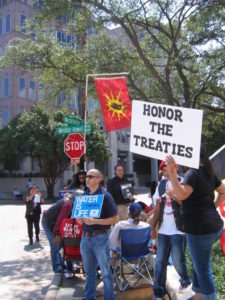 For more information about future programs, call 214-369-3313 or visit http://bit.ly/2d9FAk9. We are well past Labor Day, that yearly line of demarcation between summer and fall. Now it is autumn, and the heads of all living things bow with the weight of an aging year. The leaves fall; the cat and dog begin to grow their winter coats; all creatures start to store up their appropriate fats for the cold days coming. The writer at her computer says, “I will never live long enough to say all the words.” That realization, too, is an annual inevitable of fall, and as it should be. The season’s message is that life is fleeting. Next Sunday evening, Rosh Hashanah will come again. I will have lived to enter another new year, moving forward with our ancestors who had the wisdom to know that this time of impending death is a natural part of the greater cycle of life. Those ancestors pledged their faith when they made this season of hibernation and decay the start of the year. How many centuries it must have taken before primitive humans could really believe that the trees would leaf again, that corn would grow again, that birds would return and baby lambs and calves be born! It was an act of faith to declare that the new year starts here, at nature’s lowering ebb. It was an affirmation of belief in the future, and of life. We Jews know in our bones, no matter how assimilated our surfaces, that the uprisings of one political or racial or religious or ethnic group against another are recurring constants in the life of humanity. We have had more than 5,700 years of recorded history in which to observe this. We are not surprised that it happens, only about why no people have ever been wise and strong enough to stop it from happening. Why can’t people with wisdom and strength enough to reach the moon and beyond control their fears and hatreds of other people here on earth? At each New Year, I visualize all of humanity — from the start of time to infinity — as one huge canvas, whose frame is large enough to accommodate the dabblings of every individual. Each of us paints our own little piece, then puts our brush away. Civilization is a work constantly in progress, embodying harmonies and disharmonies. The colors, like the people, often clash, but the overall effect can be rather pleasant. As we Jews are told, it’s not incumbent upon any one of us to finish the work, but it is incumbent upon each of us to make some contribution to it. It’s hard work to use our insignificant little brushes with forethought and foresight when none of us can see the whole canvas on which we’re painting. Just to do this is an act of faith. When the trees drop their leaves, they are already preparing for spring. Animals grow fur and store fat with instinctive knowledge that the seasons spiral in regular order; they will soon enough shed them again. But each year, I work with my keyboard instead of a paintbrush, and I will do what I can for as long as I can, and then turn this metaphorical brush over to those who come after me. They won’t finish the work, either, but they too will make some contribution to it. For all of us, this is our act of faith. May yours be a very good New Year. Gross has updated this column, which first appeared in a suburban Chicago newspaper 40 years ago, earning her top honors for columns in the National Federation of Press Women’s 1976 writing competition. Its original title was Entering the New Year as an Act of Faith. Thirty Daytimers filled the room to listen intently to TCU Professor Donald Jackson express his thoughts about the upcoming presidential election only a few weeks ahead. The Daytimers were expecting Professor Jim Riddlesperger, but a last-minute conflict took him off the agenda and Jackson took his place with a fascinating and effective presentation. Responding to questions, the Daytimers audience wanted more, but finally, discussion had to end so the professor could make his next class. The insights offered about the voting populace, and especially here in Texas, made for fascinating listening and careful consideration. On Oct. 19, Daytimers will present JFS professional staffers Dr. Carole Rogers and Hedy Collins. Dr. Rogers is the director of Jewish Family Services and Hedy is its Senior Program director. Their fun, engaging and interactive presentation will help you find an abundance of free and discounted items and services aimed at you and your needs. Also on hand will be Patrick Hanna, who will demonstrate a Clear Captions telephone. It has a screen that prints out your conversation and is available to all hearing-impaired people. If you are qualified, it is available, installed, free. And there are no monthly charges for this service or the telephone itself. A soup and sandwich lunch will be catered by Rich Hollander — the soup a hot mushroom barley — the sandwich a multi-cheese grilled attraction. For reservations, call coordinator Larry Steckler at 817-927-2736. The program is free (but we need to know if you are coming), lunch is $5 and includes coffee, tea, cookies and snacks. 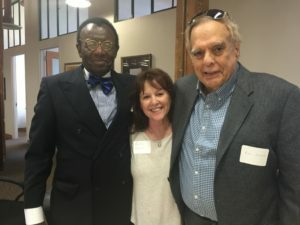 Rabbi Ken Kanter led three interesting programs last weekend at Tarrant County’s Reform synagogues, made possible with support from the Jewish Federation of Fort Worth and Tarrant County. 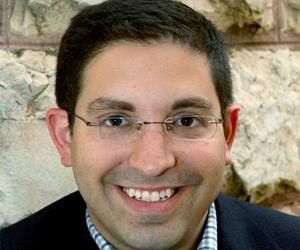 Rabbi Kanter spoke Friday night at Beth-El in Fort Worth, Saturday morning at Beth Israel in Colleyville and Saturday night at Beth Shalom in Arlington. 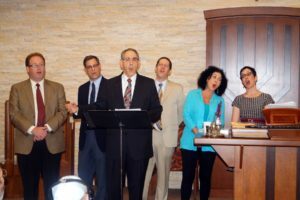 Rabbi Kanter’s Selichot program Saturday focused on the music of Tin Pan Alley and included the participation of clergy members from all three synagogues. America the beautiful: third from left, Scholar-in-Residence Rabbi Ken Kanter with his “back-up” singers, from left, Beth-El Rabbi Jordan Ottenstein, Beth-El Rabbi Brian Zimmerman, Beth Israel Rabbi Charlie Cytron-Walker, Cantorial Soloist Monica Braverman and Beth Shalom Cantor Sheri Allen. Rabbi Kanter keynoted Selichot services at Beth Shalom on Saturday night. 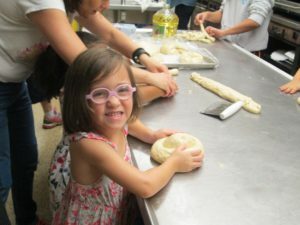 We mentioned a couple of weeks ago that Ahavath Sholom religious school students would be baking yontif challah for a fundraiser. 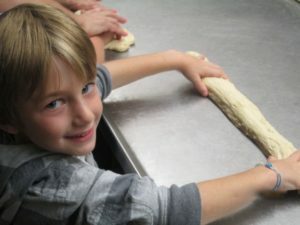 The baking began Sunday, Sept. 25, when 50 students and many adults baked about 120 loaves of challah. “It was very successful and a fun way for everyone to get involved and in the spirit of the holy days,” said Cantor Shoshana Abrams Kaikov. JWI will hold its next meeting at 9:30 a.m. Wednesday, Oct. 5, at Beth-El Congregation. Dr. Jane Pawgan will speak about Elizabeth Taylor. There will be an opportunity after the presentation to ask questions. JWI welcomes everyone the first Wednesday of every month at Beth-El for a bagel and coffee and an interesting discussion. Rabbi Levi and Rishi Gurevitch will host a traditional four-course dinner following services at Chabad of Arlington on the first night of Rosh Hashanah. “Guests will love the delicious gourmet food, which will include all of the holiday favorites, as well as many Rosh Hashanah delicacies,” said Rebbetzin Gurevitch. Services begin at 7 p.m. and reservations are required for dinner. Services are free; however, cost for dinner is $36 per adult and $18 for children under 12. For more information about this or any other Chabad event, please feel free to contact Chabad at 817-451-1171 or email info@arlingtonchabad.org. 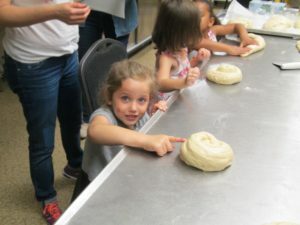 Charlotte Levi, Penny Kreiner and Liam Kuperman may have found the secret to perfect challah at a recent event. For most Americans in this election cycle, there are two states — red and blue. But for Jewish Americans, there is another state: Israel. At least according to Gil Hoffman, the chief political correspondent for the Jerusalem Post. Hoffman spoke about contemporary American politics from an Israeli’s point of view at Beth-El Congregation in Fort Worth on Monday, Sept. 19. 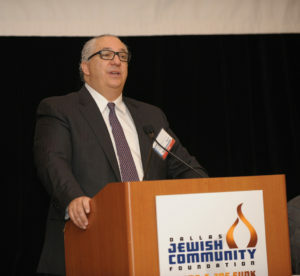 The program was sponsored by the Jewish Federation of Fort Worth and Tarrant County. Born and raised in the United States and having written for the Miami Herald and Arizona Republic before moving to Israel, Hoffman told the crowd he does not remember growing up in a hotly divided country. “Growing up in the United States I never knew if I was in a red or blue state. But now everyone knows if they are one or the other,” Hoffman said. In fact, Hoffman recalled how Israel in decades past resembled the modern United States. While Americans are hotly divided between Republican nominee Donald Trump and Democrat Hillary Clinton, recent polls reveal Israelis feel far more ambiguous about the two candidates. Israelis have a myriad of reasons to be skeptical of both major party candidates. For Trump, it goes back to 2013, when he endorsed Prime Minister Benjamin Netanyahu for re-election. In his unprecedented endorsement, Trump said he wished Netanyahu would run for president of the United States. “Trump’s advisers are taking a right-wing line on Israel. And Trump is saying things Israelis like to hear,” Hoffman said. Netanyahu, however, has remained cautious. “He remains convinced he could get along with former Secretary of State Clinton,” Hoffman said. But it is clear that among Israelis, either candidate is better for Israel than the current administration. That aid package, which was approved earlier this month, provides $38 billion in military aid over the next decade. It is the largest aid package in history. “Do Israelis take that for granted? Yes. But Obama’s strategy in the Middle East has influenced that opinion,” Hoffman said. Obama’s focus on halting Israeli settlements in disputed areas of the region, for instance, has isolated Israeli centrists. But previous presidents have also made Israelis skeptical of American leaders, especially in the period between the election and inauguration. While American politics may be in disarray, Hoffman isn’t ashamed to be an American, or an Israeli either. “I’ve never been more proud to be an Israeli and American,” Hoffman said. More than 350 students from area day schools came together this week to hear from Rachelle Sprecher Fraenkel, the mother of an Israeli teen kidnapped and killed by terrorists. Fraenkel’s son, Naftali, was just 16 when he and two other Israeli teenagers, Eyal Yifrach and Gilad Shaar, were abducted and murdered in 2014. 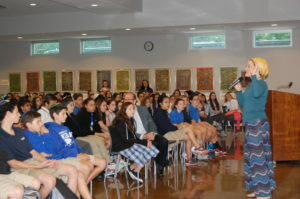 During her talk at the Schultz Rosenberg Campus, Fraenkel fielded questions from the audience of seventh- to 12th-graders from Akiba Academy, Levine Academy, Mesorah High School for Girls, Torah Day School of Dallas, Texas Torah Institute and Yavneh Academy. Later that evening, Fraenkel was the featured speaker at the Center for Jewish Education’s Night to Celebrate Jewish Education honoring Leslie and Howard Schultz. Rachelle Sprecher Fraenkel spoke to hundreds of students from Akiba Academy, Levine Academy, Mesorah High School for Girls, Torah Day School of Dallas, Texas Torah Institute and Yavneh Academy. How did you survive this experience? How did you tell your other children that their brother had died? How has this changed your relationship with God? “Before this happened, bad things were something that happened to other people. And then something bad touched me — my faith didn’t just suddenly go away. This was a lesson in humility and keeping my faith. Recently, members of the Dallas Police Department and members of the BLEWS organization met to discuss ways in which the community-minded forum, consisting of members from the black and Jewish communities, might assist police officials in the work that they do to serve and protect the citizens of Dallas. The monthly meeting was held at the Dallas Holocaust Museum. Six members from the police department attended, including members of its community relations division, and veteran officers from the department. 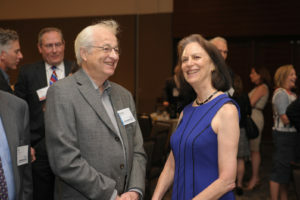 From left, Joe Green-Bishop, Anita Warner and Ken Glaser have been instrumental in getting the new organization BLEWS off the ground. BLEWS is dedicated to the advancement of the relationship between the Black American and Jewish communities through dialogue. Sergeant Shannon Browning, who performs charitable and mentoring work in Dallas when he is not serving as a police officer, said, “The police department is interested in working with groups such as yours. We believe that together we can make our city a better place for all of its people. We are grateful for your interest, and for your reaching out to the department.” Sergeant Browning said that many officers see their work as a calling. Pastor Carl Sherman, a former mayor of DeSoto and BLEWS member, said that he appreciated the work of law enforcement officials, and that he believed that citizens must work with law enforcement to bring about peace and justice in our society. “We are all in this together,” Sherman said. Officer James Songer, who regularly meets with business and community groups in downtown Dallas, said that he and other members of the department were available at any time to work with Dallas residents to promote togetherness, and to reach shared goals and objectives. “This meeting is very important,” he said. Each of the 22 members of the BLEWS organization who were present commented, telling their guests that their organization was committed to creating a just and equitable society, and that they were personally committed to seeing that it became a reality. Gabbi Butler, daughter of Stacey and Chuck Butler of Dallas, takes fundraising seriously. 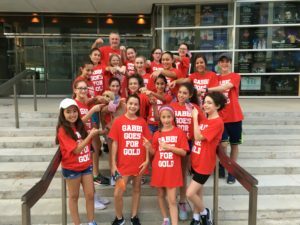 For her bat mitzvah project, the 12-year-old Levine Academy seventh-grader rallied 27 friends and family members and formed Gabbi Goes for the Gold. The team participated in the Heroes for Children Heart of Gold 5K Run last weekend in Galatyn Park in Richardson. Gabbi Goes for the Gold raised more than $6,000 for childhood cancer patients last weekend. Gabbi raised more than $6,000 and Gabbi Goes for the Gold was named the top fundraising team. The money raised goes to children who are surviving cancer. Gabbi sends a shout-out to thank all her friends and family for supporting Heroes for Children and making her mitzvah project such a huge success. She will celebrate her bat mitzvah May 6, 2017 at Temple Emanu-El. AJC will honor Jeff Zlotky with the 2016 Milton I. Tobian Community Relations Award. The dinner is co-chaired by Jill and Adam Lampert, with Beverly Tobian serving as an honorary chair. Is there any significance to the different sounds blown by the shofar on Rosh Hashanah? The Torah states in reference to Rosh Hashanah, “In the seventh month, on the first day of the month, there shall be a holy convocation unto you; you shall do no laborious work, it shall be a day of teruah for you” (Numbers 29:1). Teruah, which means to cry out, is interpreted by our sages to mean crying out with a shofar, or the horn of a ram. This is the source of blowing a shofar on Rosh Hashanah. The Talmud presents a debate as to the nature of this teruah. One opinion is that it is a slightly drawn-out sound of crying, like when one is crying out of pain, called a shevarim, or broken blast. The other opines that it is like when one draws in their breath in the midst of a cry, which is a series of short staccato blasts. This we refer to as a teruah. Since this debate remains unresolved, the Talmudic ruling is that we should do both: We do a series of the combination of both the shevarim and teruah combined, then a set of only the shevarim, and finally a set with only the teruah. The Talmud further derives from a verse that every teruah needs a tekiah, or long, straight blast, before and after it. The set of tekiah-teruah-tekiah — long, short and long — comprises a set of shofar blowings. This sounds complicated, but it’s actually quite simple once you get the principle. In short: Tekiah is the long blast, shevarim is the broken blast, teruah is the staccato blast. The Zohar reveals that there are deeper Kabbalistic meanings to each of these varied blasts of the shofar. It alludes to the crying sound of the shofar, saying that when that cry is emitted from the Jews down in the physical world, a great cry emanates from the upper, spiritual worlds. To get a bit of insight in the meaning of the Zohar, we need to understand why the shofar blast is a type of “wail”; what is it that we are crying about? The answer is that Rosh Hashanah is the first of 10 days of teshuvah, or return, leading to Yom Kippur when the Jews complete their return, or repentance, to God and return to their own inner greatness. The cry is that of the soul, when faced by its many wrongdoings and misdeeds over the past year. When it is faced by the reality of the distance between itself and the Al-mighty, the soul utters a cry. The shofar, which can have no mouthpiece, is simply the sound of the breath vibrating in the ram’s horn. The breath reflects God’s breathing the soul into man; the soul expresses itself by the breath. The soul, awoken by the shofar blast, emits a wail of pain over its distance from God due to its many mistakes. That wail, the cry of true teshuvah, evokes a cry of compassion by our Father in Heaven. A great 16th-century Kabbalist known as the Shelah Hakadosh gives the following insight: The Torah says the tekiah, a straight blast, corresponds to the verse that God created man “straight,” pure, untainted by sin. We blow that first, to focus on who we truly are and our potential. We sometimes “break” ourselves, our straightness, by our misdeeds; hence we blow a shever, a broken blast. When one fully realizes their shortcomings they cry out to God, the crying out of teshuvah, hence the teruah or short sounds of wailing. After teshuvah one’s sins are forgiven, and the person returns back to the pristine state they began; we therefore end the set with a final tekiah, signifying that we’ve returned back to our “straightness,” our prior greatness. The tekiah was blown at times of simcha or joy. For this reason the tekiah, or long blast, is sounded before and after the shorter blasts. We need to begin with simcha and the recognition of how great we are as Jews, and for all the wonderful mitzvos we’ve had the opportunity to fulfill. This includes the fact that we are of those who are in the synagogue and listening to the shofar! Then, after feeling the remorse over our distance from God caused by our shortcomings, we again sound the blast of joy over the fact that we had feelings of repentance and have indeed shortened the distance between us! May we truly embody these important lessons of the shofar. Sincere wishes for a joyous, healthy, peaceful and prosperous New Year to all the readers and all of Klal Yisrael! Some say that the words “I’m sorry” are the hardest words to say — there is even a children’s book about how hard the phrase is. But what about the words “I forgive”? Often hard to say and harder to mean! The days between Rosh Hashanah and Yom Kippur are days to apologize to those we have hurt. We are also supposed to forgive. Model forgiveness, particularly if you are a leader! Apologize and attempt to make restitution — take responsibility for mistakes. Rebuild trust by working on a common task — new experiences! Conduct interventions — bring in a third party. The article ends with an old saying (attributed to everyone from Buddha to Carrie Fisher): “Resentment is like taking poison and waiting for the other person to die.” Holding a grudge at work is sharing the poison with your colleagues. The High Holidays offer us an opportunity to bring this up at work, even if you don’t work in a Jewish organization or a place with many Jewish co-workers. Begin by explaining the holiday and traditions and move from apples, honey and the days off from work to the real message of the season that you can bring to your workplace! We see that we have two tasks before us — asking for forgiveness and giving forgiveness. In the 10 days between Rosh Hashanah and Yom Kippur, we are to go to others — what about also forgiving ourselves during that time? What are the things in which we may have hurt ourselves, either with intention or without? Can we forgive ourselves for our mistakes and our real or perceived failings? Finally on Yom Kippur, we stand before God and apologize both as a community and as individuals. This can happen only after we have made peace with each other and ourselves. And one last question: do we need to forgive God? 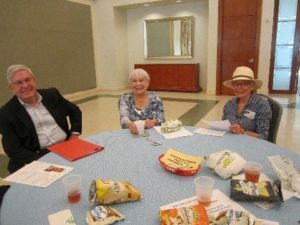 The Dallas Jewish Community Foundation annually hosts a Professional Advisors Seminar to promote the concept of planned giving, while also providing continuing education hours. The DJCF is grateful for the support of its 24 event sponsors, including the lead sponsor, Meadows, Collier, Reed, Cousins, Crouch & Ungerman, LLP, whose support has ensured the continuance of this annual event. Speaking on behalf of the lead sponsor, Josh Ungerman expressed his mutual gratitude for the foundation, explaining that it’s a “real honor to be able to partner with the Dallas Jewish Community Foundation, and it is a partnership. This year, the DJCF welcomed nationally recognized speakers Mickey R. Davis and Melissa J. Willms, partners in the firm of Davis & Willms, PLLC in Houston. 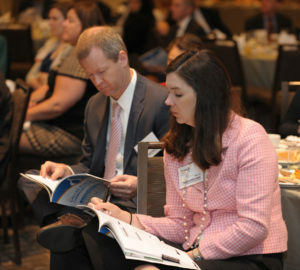 As legal experts in their field, Mickey and Melissa educated attendees on emerging techniques in the areas of charitable and planned giving, and estate and tax planning. Mickey and Melissa’s knowledge on this subject matter made it an invaluable morning for those in attendance. 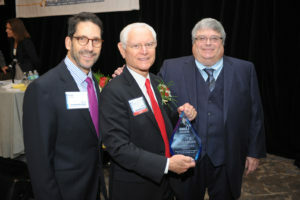 An additional highlight of the seminar program was the DJCF’s surprise honoring of Ira Silverman for his 10-year commitment as chair of the Professional Advisors Seminar. Ira’s dedication to the foundation runs deep, and includes his involvement as a past chair and life trustee. Ira said, “I enjoy being involved with the seminar. When I see professionals in various settings, someone always seems to come up and wants to talk about the seminar. I feel like a year-round walking advertisement.” The DJCF is proud of another successful year, and looks forward to planning 2017. For more information about the Professional Advisors Seminar, please call 214-615-9351 or visit www.djcf.org. There is so much to do and think about to get ready for the High Holidays — that is why we have the month of Elul to prepare. One of my “jobs” at the J is to blow the shofar each morning. I’m not an official “shofar blower” but I can do a pretty good tekiah gadola. By blowing the shofar each morning in the J lobby and the Early Childhood Center, we are reminding all who come in that it is time to get ready to make changes in our lives. And here are three High Holiday greetings — start practicing. Saying “Happy New Year” is good but these are even better!! That’s all the readiness for this week — there are so many thoughts and ideas plus wonderful traditions. Come up with a new tradition for your family this year — how can you make this new year special and continue building on it each year?